Every team utilises different build-up patterns in order to move into more advanced areas of the pitch. These differing principles vary widely depending on each coach and the players at their disposal. But one such tool that many teams utilise is the use of vertical passing in the first phase of build-up. If completed successfully, this allows for instant progression of the ball into a more advanced area of the pitch and past one, or sometimes two, lines of opposition pressure. Whilst this type of pass can be a good way to advance play, it is often difficult to complete for a number of reasons. It has to be deliberately created by the team in possession. There are a number of ways to do this, such as quick horizontal circulation. But regardless, if there is not a suitable support structure around the receiving player, then they will find it hard to retain possession. The other factor to consider is the field of vision of the receiver and supporting players. Because of the nature of the pass, the receiving player will often be facing towards their own goal. This is not a problem if the play is in that direction, but it limits ability to transition and progress play quickly. One of the main advantages of a vertical pass in initial build-up phases is that it breaks two lines of opposition defense, meaning the opposition midfield are in front of the ball once the pass reaches its destination. This presents a potential transition chance; but this window of opportunity can quickly close. If the forward receives the ball with his back to goal, and is expected to turn past a defender behind him, the opening for transition may disappear. If the centre back plays the ball into the forward in this situation, it’ll be received in a 4v1 and they can say ‘bye bye’ to possession. In order to stop an immediate loss of possession, the receiving player will need a suitable support structure around him. What this structure is comprised of depends on a number of variables. For example, the individual profile of the receiving player can alter the optimal structure. Some players are comfortable receiving the ball with their back to goal and changing direction in one fluid movement. In these cases, his teammates may focus on maintaining a larger distance away to create space for a 1v1 opportunity with the opposition CB. But if the receiving player is less mobile, nearby players with a forward-facing field of vision will be more helpful. This type of pass does more than merely winning space in an advanced area. If the nearby players are well structure in accordance with their skillset, then it allows a number of following options. Because it can allow for a number of options that the receiving player can utilise, it is a useful tool for teams utilising positional play. Whilst some teams may use it to create third man runs, others may look to create dribbling opportunities or combination play in a dangerous area behind the opposition midfield. Even with a good support structure, one of the most important features of a positive ball progression is the pass itself. The pass can be particularly important if the receiving player has his back to goal or a limited field of vision for any other reason. This is because it can act as a form of non-verbal communication, potentially giving an indicator of the situation that is out of view of the receiving player. If the player that drops back from the front-line to receive the pass is being tightly followed by a man-oriented opposition defender, a pass hit with slightly more power could signal space in behind. The increased pace on the ball makes it easier to turn and begin moving around the defender in one fluid movement. If the defender hangs back and the forward drops into an area with more space, a slower pass would make it easier to control and signal to the receiving player that he has more time to turn. A slower pass into space also suggests the receiving player move into that space to receive the ball. In a similar way, the accuracy (or aim) of a pass allows the receiving player to act differently based on very fine margins. A pass played with power outside the receiving player’s feet will almost always force him to turn in that direction, unless he is particularly skilled at manipulating the ball. This is useful if the player can quickly turn that way and manoeuvre his way past the defender. But a pass played with large power towards a player’s feet allows him to trap the ball aggressively towards a nearby teammate, merely altering the initial passes direction rather than creating more power on the pass. This combination of speed & direction creates many different permutations. Even then, the receiving player’s interpretation of the pass should also be considered. The same pass may have different meaning to a different receiving player, who will interpret it with his own skill-set in mind. If Andy Carroll receives a ball outside his left foot at pace, it’s unlikely he’s going to turn him and sprint in on goal. As well as using the pass as a signalling tool for the receiving player, nearby teammates can also adapt based on the speed and accuracy. Whilst a pass is generally completed in less than a second, this still allows the opportunity to alter body positioning and move a few valuable yards. This can make a big difference, particularly against a compact defense. When combined with certain needle moves from the receiving player, this can even be used to fool nearby defenders and create an extra yard of space. Because it is understood that a strong pass to the right makes it easier for the receiving player to turn to his right, many defenders will react as if this is likely to happen. If the receiving player does a simple drop of his shoulder to feint a movement in that direction, it is almost instinctive for the opponent to go that way. In the same way, the player making the pass can utilise different body positions to manipulate the opponent’s movement. Players will make judgements on the potential destination of a pass before the pass is actually made. This can be achieved by looking at the player’s body & leg positioning and field of vision. In many cases, players at the top level will hypothesise the direction of a pass before it is even made, as the passing player’s body, leg & eye positioning suggests it. However, when this does not happen, it gives the defenders less time to anticipate and make a decision. In some cases, it may even fool them entirely into moving the wrong direction. Sergio Busquets is the master of creating the illusion of passing in one direction before actually passing in another. His head & body are positioned in such a way that the opposition believe he is passing into the ‘fake’ passing lane; this shifts them to the side and creates space for him to pass into in a more dangerous area. If the nearby teammates are well-positioned, the players should be able to react in a number of different ways based on the speed & accuracy of the pass as well as the decision making of the passing player. This creates a dynamic support structure that the team can collectively adapt to whilst the pass is in motion and at the whim of the passing & receiving players. This allows a number of different options for the receiving player, and a huge number of potential patterns of play for the team in possession. Here Bender is temporarily not available for a pass, but he will be open as soon as Gotze receives the ball. Hummels fires a quick pass to Gotze’s right foot; the speed of the pass and aim towards Gotze’s right makes Kacar believe that Gotze is turning that way. Kacar comes sprinting in, but Gotze notices this and fakes to his right before passing to Gundogan and moving into a more advanced space himself. Kacar attempts to close down Gundogan, but this temporary 2v1 makes it too difficult for him to regain possession. Gotze receives the ball again, combines expertly with Lewandowski, and scores. Increased speed on the pass from Hummels presents potential options for Gotze that would otherwise not be available. Specifically, the feint to his right would be much less effective if Hummels had played a slower pass. It is for this reason that passes hit with increased speed (but still with good accuracy) are an extremely valuable tool in any build-up play, vertically-focused or otherwise. Indeed, when Thomas Tuchel began his managerial stint at Dortmund, his initial training sessions were focused explicitly on passing speed. In some cases, he even modified the ball-striking technique of some of his players. Since then, Dortmund’s build-up has improved massively. The Gotze goal is also an example of why a more direct pass in build-up is so effective against man-marking. Kagawa drags his marker wide to create the space for Bender & Gotze, who has himself drifted in from the right to lose his marker. This effectively leaves Kacar alone in the centre of the pitch to defend three players by himself. Whilst there are a number of different variations, man marking is an inherently reactive strategy – it involves mimicking the movements of the opposition. This allows the team in possession to dictate the tempo of the game, and also makes it easier to create large open spaces, or a large amount of smaller spaces to turn into. This is helpful for teams hoping to integrate vertical passes into their build-up scheme. This leads onto another important facet of the pass: timing. Because of the nature of football, any defensive scheme (man marking or not) will leave a gap somewhere. In order to create the strongest scheme possible, teams will attempt to ensure these gaps are in the least dangerous area. One such area that teams do not often prioritise against is central defenders and their passing. This means they have more time on the ball than any of their teammates, giving more opportunity to assess the situation in front of them and play the optimum pass. It also gives them a greater chance to alter the timing of their pass to suit the receiving player. Altering the timing of the pass by half a second will be pivotal in determining the success of a pass. Despite (some) pressure from the opposition forward, Blind holds onto the ball a few seconds longer to ensure Lingard receives the ball at the perfect time. This pass is played by Blind into an area with no support structure. It is therefore imperative that the run from Lingard is co-ordinated perfectly with the pass. If the pass reaches Lingard too early, then he will be running quickly towards his own goal. Combine this with few potential passing options for him, and it will be tricky to retain possession. If the ball reaches him after the ‘peak’ of his run, then he will be facing the opponent’s goal and the ball will be more difficult to control, particularly whilst running at speed. These same principles apply to more team-oriented build-up plays too. From TP’s team analysis of Hertha Berlin: the timing of the pass from the GK is vitally important in allowing Darida to receive the ball in space. If he releases the ball too early, then Skjelbred will still be blocking the potential passing lane. Too late, and the opposition will have time to react, and can limit Darida’s space. Because central defenders (and goalkeepers) are generally given more time to play the ball, there is often room for them to move into with the ball (maybe not goalkeepers). In order to leave a man free at the back themselves, the man-marking team will task their striker with man-marking both of the opposition central defenders. Depending on which player has the ball, the striker has to shift laterally to defend that player. Not only can this be tiring and inefficient for the individual, but it can also create serious issues for the defensive structure if the in-possession central defender utilises a sharp forward movement with the ball. The principle of provoking the press (or ‘Andribbeln’) is a vital feature of positional play, and a key aspect of German coaching education. This concept is easier to initiate against a man-marking system in this way. This is because if the initial sharp movement forward from the CB is successful, then they can advance into midfield and create numerical superiority. This forces a midfield player from the opposition to make a decision: stay with your current marker, or confront the new opponent. Both options are dangerous. If they choose to move away from their direct opponent to confront the onrushing CB, then they risk leaving that player free in space. If they choose to stay with their direct opponent, then that player can merely drift away from the CB’s potential dribbling lane, meaning he can continue progressing forward into an even more advanced area. Assuming that merely allowing the CB to move forward is not a suitable option, the two most efficient ways of dealing with this for a man-marking side are both difficult to perform. 1) Perform a switch of direct opposition to mark. When the CB progresses with the ball, a midfielder confronts him, and the striker (originally tasked with marking the CB) moves back to cover the opposition player left free. This still relies on larger backwards movements from the striker, meaning he is out of position for a quick transition if possession is regained. As well as this, it also means the other CB is available for a quick outlet pass, and the process can begin again. This creates huge [often unnecessary] physical demands on the striker in question. 2) Rely on the onrushing midfielder to confront the forward-moving CB *and* close the passing lane to the player he was previously marking. 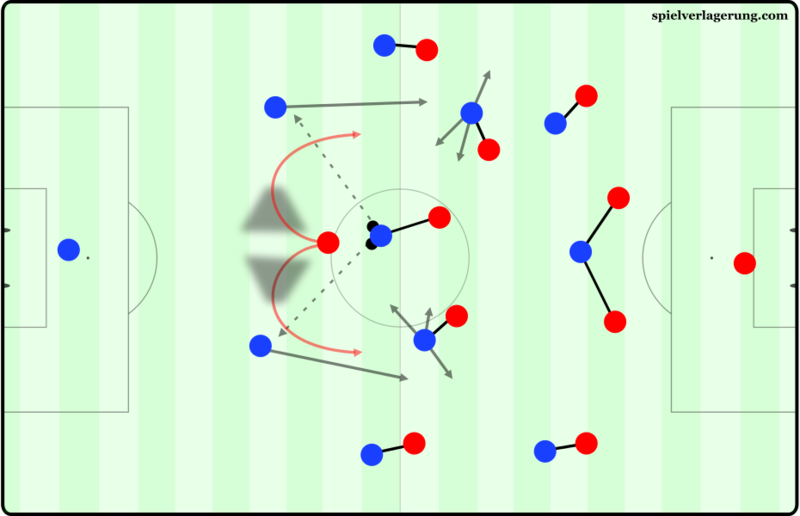 Considering the CB is moving at high speed to evade the striker, and the previously-marked midfielder may make a lateral movement at any moment, this is very difficult to perform successfully. Pep Guardiola aggressively utilised this strategy against Bielsa’s man-marking Bilbao team. Here, Mascherano steps past Llorente, and moves into midfield. Bilbao are able to perform a switch of markers between Llorente & Muniain, and the build-up play does not break through the midfield. But no problem. Recycle back to Geri Pique, and more of the same. Poor Llorente. This aggressive forward positioning from his central defenders (Mascherano particularly) was mentioned in Marti Perarnau’s book ‘Pep Confidential’. Guardiola was explaining to Javi Martinez how he attempted to get Messi into space in dangerous areas by moving Mascherano forward, forcing one of the Bilbao markers to abandon their man and move towards Mascherano. Messi would then drop into the vacated space, and offer himself as an immediate passing option. Even if Messi were not available, someone else would be. 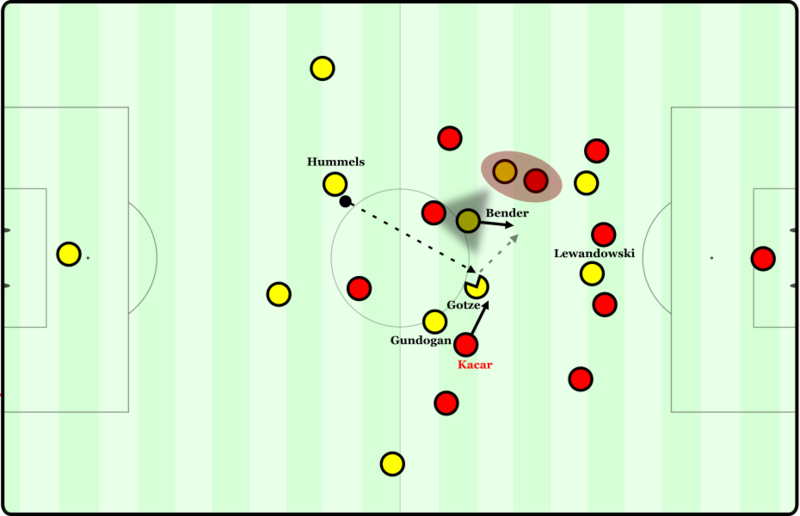 The build-up to Hummels’ assist for Reus during the turbulent Europa League match between Liverpool & Dortmund. Liverpool’s situational man-marking means it only takes one pass from the central defender to the striker (and then… to the net). This relies on good passing speed in the horizontal passes leading up to the forward movement from the central defender, to ensure the striker does not have time to adjust. The same principle applies when facing a zonal marking system, especially if the opponent are particularly ball-oriented. A quick lateral shift in play may create space in a more advanced area by disrupting the horizontal compactness in the opposition block, unless they are all able to maintain equal distances whilst shifting. For obvious reasons this is more difficult to achieve if the opposition’s first line of pressing has two players, but in these cases there are potential for overloads elsewhere and the need for a central defender to move forward is lower. Although, this also presents the opportunity for a move to a back three with the free man again advancing to create a situational numerical overload in midfield. This is also a tool that Guardiola has utilised, with David Alaba being played as a ‘box to box CB’. This can also be achieved with a situational back three with a midfielder dropping into the first build-up line, or a full-back moving into a more central position. Of course, there are enough potential combinations for any attacking system and the resulting man marking response for a whole other article. But these principles generally apply regardless. Breaking down zonal marking systems using vertical passing is slightly more difficult because these free spaces cannot be created so easily. Whilst it is easy to break down a man-marking system before the initial vertical pass is even made, playing against a zonal system also necessitates an adequate response to the pass itself and therefore the following support structure is vital. This can be achieved, for example, through the use of a basic one-two pass. For obvious reasons, most central defenders do not have the luxury of following their pass with an off-ball movement. But midfielders, who have more license to move into advanced areas, can combine passing accuracy & aim with runs of their own. This creates a number of different passing options and combinations, which present the chance to break down even the most well-organised & compact defense. Utrecht attempt to break down a compact man-oriented zonal marking system from Groningen. Because of the well-spaced triangle formed in the centre of the pitch, there are a number of off-ball movement options for each player. The receiving player has an inward-facing field of vision, so the passer opts to aim the pass at his right foot and makes the movement inside. The forward movement of the initial passer creates a temporary overload if the midfield fail to adjust to his new positioning. This overload of the zone where the ball will be immediately after the vertical pass is a key way of exploiting the space between the lines that is more apparent in zonal marking systems than man marking. When this temporary overload is combined with a number of potential movement options and a variable support structure, more potential combinations of play and movement patterns are created. This makes the attack more fluid, less predictable, and harder to defend. Creating a suitable support structure prior to the vertical pass from defense is one key way to overload a zonal marking system. Because of the nature of long, vertical, ground passes, the opposition needs to be well-covered in a number of zones to defend them successfully. It is difficult to balance a high press with successful deep coverage within one system. Generally, there is more space deeper in the opponent’s midfield if they are attempting to press high as they attempt to utilise their players in more advanced areas of the pitch. This leaves less players to cover a larger space in deep areas. If the opponent is attempting to utilise a high line to facilitate a compact shape *and* high press, then this leaves space in behind. As mentioned earlier, a pass hit with slightly more power may allow the recipient to make use of this space more easily. Ideally, the primary supporting player will be positioned so as to be able to make a movement in behind the defense, or into the space between the lines, depending on the pass. “In all of these situations the first decision for the player getting free is if he’ll run into the gap or if he’ll already be positioned. The first decision helps him in terms of visual field of opposition who either don’t see him or have to lose eye contact to the ball carrier. In the first picture left he drops and receives between opposition, so he has more space to turn into. In the second picture he goes into depth, so he can either break through or lay it off to his team mate – who is positioned in a way that if he gets pressed he can get his body between ball and opponent most easily. In the latter he moves centrally in between these four which gives them a tough decision who will push out to press (or if it will happen).” – RM in his article on creating a game model. When these principles are utilised collectively by a team, it can create a support structure with huge variation. If the ball is lost, then it is important to complement this structure with an aggressive challenge for second balls. An additional advantage of having a temporary overload in an advanced area of the pitch is that there is an immediate opportunity to counterpress and regain possession quickly. The fact that these vertical passes can break two lines of opposition pressure instantly progresses play forwards and deep into the opposition’s block. Whilst this presents potential for an immediate transition into even more dangerous situations, there is no need for the team to be too aggressive in their decision-making. Much like in the previous example when Mascherano was unable to break through the opposition’s midfield, a sharp vertical movement presents opportunity for all of his teammates to move forward. When the ball was returned to Gerard Pique, he was 20 yards further forward than when Mascherano began his movement. This same principle can apply to the use of vertical passes. Whilst this is not the perfect situation for the team in possession, it offers a handy failsafe should the initial attempt at penetrating the opposition defense fail. They attempted to aggressively attack the lack of compactness in Team White’s midfield, and when this was unsuccessful (perhaps due to poor passing speed or any other reason), they were able to recover and regain possession. For some teams, this recycling of possession into a more advanced position can be the end-goal of this type of pass. Instead of aggressively pursuing combination play behind the opposition midfield, their aim will be to ensure they are well structured for build-up when the ball is returned to the defenders. This might mean, for example, that a winger in a 4-4-2 shape would stay wider rather than move inside to involve himself in potential combination play. Instead, remaining wider would allow for a route out of the inevitable pressure that will come from all directions once the initial vertical pass is made. Once the vertical pass is made and the opposition midfield attempt to move behind the ball. This allows the first build-up line to collectively progress into a more advanced area utilising positional play. Using the vertical pass to move first build-up line forwards: Team White recover their lack of compactness quickly, and Team Red are simply able to recycle possession in a more advanced area. Some teams may use longer diagonal passing in much the same way. This has the added advantage of being even more separated from the high press of the opposition, and gives more opportunity for added overloads. It does also run the risk of separating the players involved from the play if a long diagonal is not utilised, though. It can also be effective to utilise the exact opposite of this strategy: moving the ball backwards to provoke the press and disrupt a compact opposition shape. When confronted with a team who is well-drilled at shifting sideways to adjust for horizontal ball circulation, provoking the press may come in the form of disrupting the opposition’s vertical compactness. Shifting the ball backwards can disrupt the distances between the opposition forwards and midfield. If an opposition forward moves to pressure the ball-player, a well-structured backline will often have a spare man (particularly if the goalkeeper is utilised as part of the first build-up line). This 3v1, 3v2 or 4v3 can be punished with a pass to the open man and a quick circulation of the ball into a more advanced area of the pitch. Whilst the ball may end up in the same space that it was in before the backwards pass, the opposition defensive block will be stretched and there will be more space for the receiving player. This can present immediate transition opportunities if the team builds with good passing speed and is well-structured in advanced areas of the pitch. Ingolstadt shift well horizontally, but the diagonal-backwards pass from Kimmich to Neuer creates a more complex set of movements to collectively co-ordinate. The vertical compactness is broken and many spaces open in midfield for Thomas Müller to feast on. Passing angles also alter the effectiveness of build-up play for ground passes too, and diagonal passes in initial build-up phases are often preferable to horizontal or vertical passes. As well as the field of vision benefits mentioned previously, they also combine some of the best features of each pass type. Much like vertical passes, they progress play into a more advanced area and often break opposition pressing lines. They also contribute to shifting the opposition sideways, potentially creating space between players and breaking horizontal compactness. Against zonal marking systems, disrupting the opposition’s defensive spacing can be key to finding the space needed to break through. Whilst having more strategical advantages, these diagonals are also more difficult to play. Man-marking systems can be manipulated into creating space, but well-spaced zonal marking systems are generally able to better close diagonal passing lanes. This is where passing speed becomes increasingly important. As well as this, some players have developed individual styles to open passing lanes that may not be available to others. As mentioned previously, Busquets creates the illusion of passing in one direction before actually passing in another. Mats Hummels seems to have mastered an outside-of-the-boot through ball into the left halfspace, allowing the runner to receive the ball curving towards goal. Leonardo Bonucci is capable of chipping the ball over one line of pressure but dropping it into a small space, often rendering cover shadows meaningless. Xabi Alonso has developed a bullet pass that skids along the ground at huge speed, making it difficult to intercept. These individual skillsets can alter a team’s build-up style quite significantly because of the additional passing lanes they create. By the very nature of the vertical pass, the first supporting player cannot be in the same vertical line as the player receiving the initial pass; otherwise they’d be in the way. Because of this, the first supporting player will have a tilted field of vision towards the play. If this pass takes place in the halfspace, it allows the player to have an improved view of the play. This same principle applies for players receiving a vertical pass in the halfspace and then immediately turning inwards towards play rather than playing a wall pass to a nearby player. If this happens in the centre, they have to turn in one direction, meaning they cannot immediately see the other side of the pitch. But in the halfspace, this means they are temporarily oblivious to merely part the wing area. However, it should be noted that if this logic were extrapolated, it would indicate the wing is the ideal area for the vertical pass (as they can see the whole pitch from the wing, right?). This is clearly not true. It is important to manage the benefits of a clear field of vision with the increased number of potential passing options and strategic advantages that the halfspace offers. If the initial vertical pass is made into the halfspace, and the receiving player has limited options in the centre, then it’s likely there will be space to utilise wide. But if the initial pass is made into a wide area, there is only one direction to move. This also highlights the advantages of diagonal passes into the halfspace from the centre for players attempting to turn quickly. The player receiving the ball will have an inward-facing field of vision, allowing for more of an immediate view of play. It also means they have to perform a half-turn rather than a full 180-degree rotation to move towards the opposition goal. Some players are even capable of performing a half-turn before the ball gets to them by altering their body positioning whilst the pass is in motion. Gotze checks behind him before the pass, and then opens up his field of vision whilst the pass is in motion. As the pass is being played, he is facing Alonso completely. By the time he takes his first touch, he is facing horizontally. Finally, his second touch completes the rotation. Beautiful. The firm pass from Xabi Alonso further aids this process, and the natural pace on the ball forces Gotze that way and into the open space. If the receiving player is on the end of diagonal balls from the centre to the halfspace, and has this ability, it can allow for halfspace penetration even without a necessary support structure. It goes without saying that this can greatly increase the build-up possibilities for a team. Can i get the link for the goal attributed to the buildup involving Hummels ,lewy ,Gotze in which gotze finally scores? This is just amazing, thanks for that! Fantastic analysis. Keep these articles coming!